A grizzly bear chalkboard silhouette acts as a sign with the handwritten text, "A LITTLE MAN is on the way!" and your baby shower invitation in a typography format. 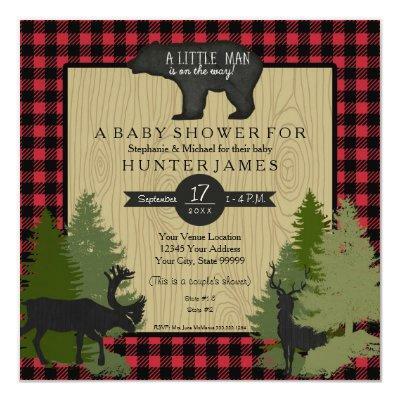 The perfect baby shower invitation for your favorite woodsman, hunter, lumberjack or outdoorsman who is having a son! With a buffalo plaid pattern lumberjack flannel shirt border and faux bois (wood grain) pattern in the text areas this invitation collection is both traditional and very modern. Chalkboard style banner, typography day, date and time pennant and woodland animals - bear, deer and elk with pine and fir forest tree silhouettes. Your party information is easily changed out using the simple template fields provided. If you require any assistance or need any additional products designed to match simply message us!